The Pink Hammer by NZ playwright Michele Amas. The Order of St John is looking for Volunteer Actors for their National Youth Competition on Sunday 14 April 2019. This is the first Sunday of the School Holidays. This will go ahead, rain, hail, snow or sunshine. You will have our very grateful thanks and appreciation. 1st preference is for people over 18, yes that can include over 60's We will possibly require up to 35 people of varying ages and probably a 60/40 split for men and women. Anyone volunteering will need to be okay with being touched. You will be playing the part of patients in scenarios. Having said that you will be given one role in a specific scenario for the day. You could be in a trauma; CPR; Medical or Caregiving scenario. You will be asked to dress appropriately for your scenario. If you are in a scenario that requires your clothing to be cut, it will be provided for you. Please dress in OLD, WARM, LAYERED clothing. It is easier to take something off than arrive with not enough on. Throughout the day you could possibly be doing your scenario 12 times over, so consistency of acting is paramount. We are also looking for approximately 16 people over 18 for preference to be marshals for the day. That is taking teams or individuals to the scenarios. All the information below applies to them also except the size info. You just need to be able to walk up and down stairs and long distance in some cases. The folk will need to be there by 7-00a.m. Breakfast, lunch, morning and afternoon teas will be provided onsite. If you have a specific dietary requirement, I would need to know that when you register. To register please email Gay Rowe on revd.up.gr@gmail.com stating name, age, x-lge, lge, med or sml size,(this is in case I get a specific request )a phone number would be handy also in case I need to change something last minute. I am also contactable on 021860878. Texts okay. new 2019 dates and information. If you would like to direct a play that you feel passionate about we would like to give you the opportunity. The selection policy is to ask directors to submit two or three plays for consideration in our yearly programme of four plays each year. If you would be interested in directing but you have no particular play in mind, the selection team can advise on plays which will help create a varied programme, offer interesting acting roles and please our theatre-going audience. We would be keen to hear from anyone interested in directing a pantomime or similar (small musical, TV series etc) as an end-of-year show. Titirangi Theatre, based in Lopdell House, has been a part of life in Titirangi since 1935. The theatre has a long history of producing a wide range of both old favourites and exciting new plays. 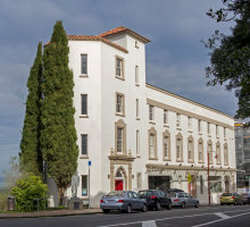 Titirangi Theatre is part of the Lopdell Precinct.